Again on Y!J auction for only 4,000 yen Straight-Buy. Gosh, guys, it's a steal! Cause the quality of the casting is outstanding, one of the best in my collection! As an owner of this kit I can totally recommend it - the quality is superb! DonkeyBlonkey (Vor 5 Jahren) #1628060Oh man... I want!!! They need to make Beatrix and Irisdina! Yeah, right! You had ruled it out :) Nice! creo_cat (Vor 5 Jahren) #1528733yeah, it's not Yamashiro. 100%: PICTURE #714771 Must be this girl images.wikia.co... . From Schwarzesmarken. Actually I don't think that this one is Yamashiro Kazusa, cause if you look carefully you can spot glasses on her face. 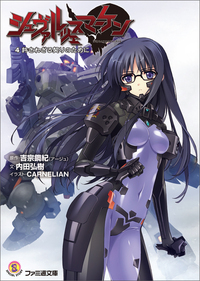 And she never were glasses, at least not in the anime (see muvluv.wikia.co..., for example).